Every manufacturer of soundboards have there own "unique" sound. 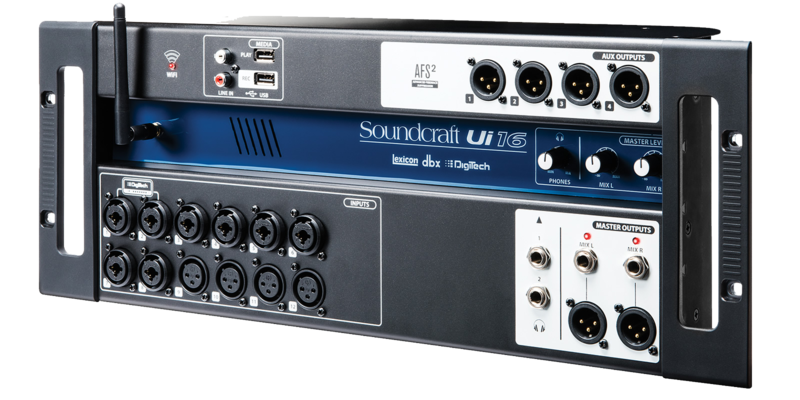 Soundcraft soundboards have pristine sound quality built in. Harman's Soundcraft soundboards with on-board Lexicon FX, JBL Touring speakers, and AKG Microphone's are a perfect combination for unparalleled sound and performance. This is just one more vital piece that helps us to insure that your event will also sound good. With 32 channels of analogue input to 27 analogue outputs, plus 6 digital inputs, 4 Stereo FX Returns and 6 digital outputs in one chassis. As standard, Input to mix capacity is 46chs, but by adding a stagebox (compatible with the existing Vi racks), simultaneous channel count increases to 64. Channels are routable to 24 multifunction busses, plus LR and Mono Mix busses. Up to 8 of the busses can be configured as Matrix mixes, each with up to 16 sources. 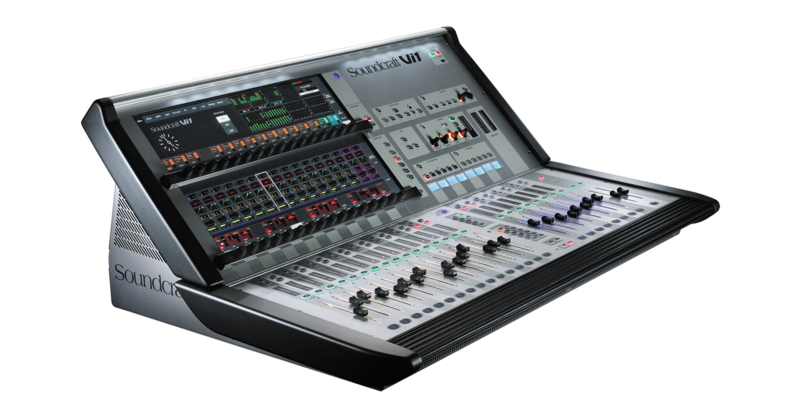 The surface is just over a metre wide, and includes 16 motorised channel faders with fixed and user-definable layers, 8 output/VCA faders and 2 master faders. What's really cool about the Vi1 though, is the new Widescreen Vistonics interface, which will be instantly familiar to anyone who's driven a Vi6 or Vi4, as well as retaining the same 'walk-up' user-friendliness of the other Vi consoles. This new development displays all parameters for 16 channels side by side, on a single 22" Vistonics touch screen. The upper half of the screen handles the Output section control as well as Cue List or Menu displays. Parameter control is via two rows of 16 rotary encoders. Exactly the same channel functionality as the Vi6 and Vi4 is available here, along with all the same core snapshot, talkback and monitoring facilities. Naturally, the Vi1 inherits many of the facilities of its larger siblings, including Soundcraft FaderGlow™, 4 stereo Lexicon effects engines, BSS Audio graphic EQs on all output busses, and integral dynamics on all channels. The desk is also compatible with Vi2, 4 and 6 show files. 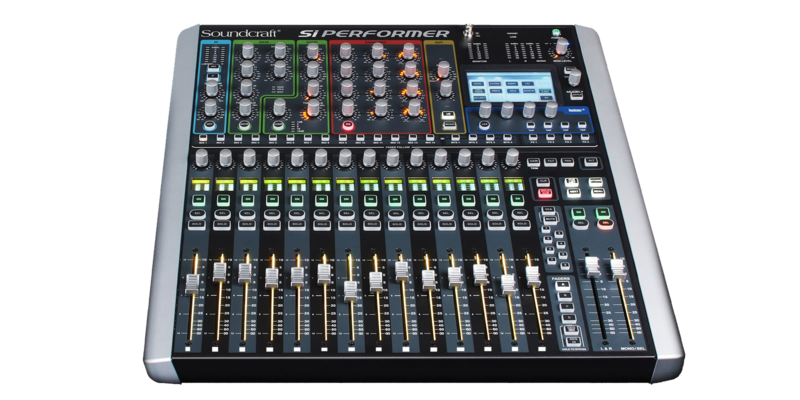 legendary Soundcraft quality and the powerful and intuitive Vi Series digital live sound mixers, the Si Performer brings unparalleled mix power and performance to small format digital live sound mixers. Sitting where a plethora of gear once was, the Si Performer delivers the equivalent of 448 rack units of DSP including sophisticated 4-band fully parametric EQ, full dynamics processing, a comprehensive range of output options, totally flexible routing and, as with all Soundcraft consoles, an unmatched range of options to fully integrate the Si Performer into an existing system or become the centre of a thriving new installation. with iOS, Android, Windows, Mac OS, and Linux devices, and can use up to 10 control devices simultaneously. In addition, the Ui12 and Ui16 each feature built-in HARMAN signal processing from dbx, DigiTech and Lexicon, including dbx AFS2, DigiTech Amp Modeling, and more. Both models feature fully recallable and remote-controlled mic gain and phantom power, along with 4-band parametric EQ, high-pass filter, compressor, de-esser and noise gate on input channels.